My family has always celebrated birthdays. Some of my best memories are of birthday parties. I even linger over the memory of watching my brother Steve's birthday party from my bedroom window because I had measles. It was awful then, but now, I just giggle. Yes, I got the measles, those red spots that just exploded over my body. They were the "three-day measles", highly contagious, but here and gone in a week. I don't remember much about them other than it was a beautiful early May and I was confined to my second floor bedroom. When I needed to use the bathroom, I had to announce it so everyone got out of the way. Mom brought my meals to me. It was kind of like a hotel except my brother had a birthday party and I sat in my window and watched them having fun when I hadn't been out of the house all week. Dan's birthday is in October. 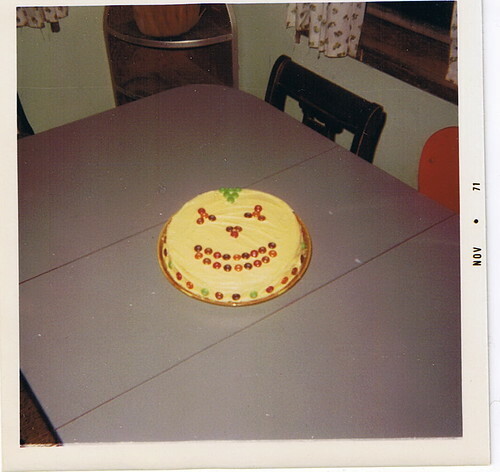 When mom was teaching me to cook, she had me make his birthday cake one year. I got to decorate it with M&M's. This was long, way long, before seasonal packages were even considered so I spent an hour sorting the colors and applying them to the orange-flavored frosting. I do remember the frosting was orange-flavored, but I don't remember if it was hand made or something we got from a container. Pre-made frosting in a plastic container was a new idea at this time. I remember when "pre-made frosting" meant you added milk to an instant powder and whipped it. Who else remembers Dream Whip? I see a few hands. You know, I'd buy that if I could find it now. It had so many applications and had a tighter consistency that Cool Whip can replicate. As we have grown older and spread out to live our lives, our birthdays have become just another day. Some of the family came to my house when I hit the half-century mark. We all gathered when mom hit 70. We'll do it again when she hits 80. Sometimes, I remember to get a card in the mail so it arrives on or before the date. Sometimes, I miss the date but still get the card out. Sometimes, the card doesn't get mailed or even purchased. I look at the calendar and think, "Oh yeah, there was that birthday I forgot." We get busy and it's just one more thing to remember. And your birth order can have a lot to do with it. As first born, I go through life plowing the way for my siblings. First to turn 18. First to turn 30. First to turn 50. Those milestones can be forgotten when you get to #3 or #4 child. It also matters whether you mention your upcoming birthday. If it's little more than a date on the calendar, we're not so liable to remember. With grandkids running about now, it's easy to feel that birthdays are for the little ones and not for us. So, when this Iowa trip presented itself, I looked at the calendar and realized the brother who is 18 months younger than me would have a birthday while I was there. Steve tends to be forgotten in the rush of life so why not have a small, simple party to celebrate? Three of the four of us siblings would be there. Sharyn is off to Idaho for a Forest Service job this year, but Dan and I could "celebrate", meaning we'd have cake and ice cream. Mom set things up and we debated on making a cake. We could do the usual 9x13 pan with purchased frosting and then get candles but I wanted something a bit fancier. We opted to go to the bakery at the local Hy-Vee and buy a premade cake. They would have a baker on site who would be happy to add "Happy Birthday, Steve" to the top of a sheet cake. We'd head over to Christina's, have a little party with paper plates and plastic silverware and everyone would be happy. We had picked out a rainbow frosted cake when mom spotted this. How can you not be happy looking at this? It's made of cupcakes. There were chocolate and vanilla cupcakes, half and half; variegated buttercream frosting, sprinkles and a big "happy birthday"! It's perfect. There's no "I don't want that big of a piece" and Christina could easily parcel out the remaining cupcakes to her brood, instead of having to deal with cake pieces. Cup cake cakes are all the rage now. I've heard of them being used as wedding cakes. 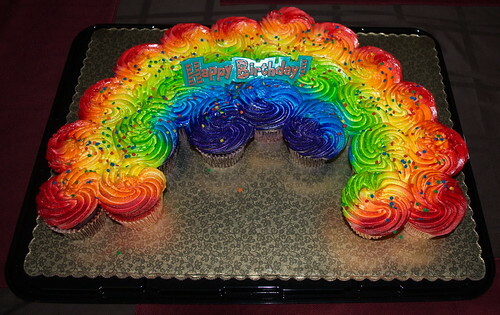 I love the vibrant colors in the frosting. We had picked out a sheet cake with the same brilliant hues before mom saw this. It was a big hit and there were just enough cupcakes that people who wanted a second one could have one with only a few left over. Of course, the oldest grandkids wanted the purple and blue frosting. It was just a small gathering and didn't last beyond 90 minutes, but it was enough to remind everyone that celebrating a birthday can be as simple as cupcakes and ice cream. I'd go for that. They do still sell Dream Whip. I see you can buy it online.